The health benefits of cayenne pepper have been documented for years. This spicy, dried chili pepper is not just a delicious ingredient in Cajun food. It is virtually a medicine chest which can be used to treat numerous ailments. In some cases, cayenne even acts as a facilitator to help other herbs work more effectively in your system. While some herbs seem to be very specific to which part of the body they are capable of healing, cayenne seems to work on many different levels. 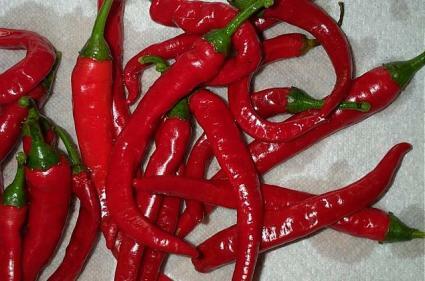 Cayenne pepper, also known as capsicum, is made from dried hot chili peppers. Capsaicin, the property that gives cayenne its heat, is also primarily responsible for the herb's healing benefits. According to Memorial Sloan Kettering Cancer Center, studies show cayenne to be cytotoxic to drug-resistant lymphoma and to deter leukemia cell growth. In addition, MSKCC states that cayenne is alleged to treat several additional health disturbances including burning mouth syndrome, circulatory issues, colic, diarrhea, headache, high cholesterol, motion sickness, intestinal gas, and toothache. There is some evidence that cayenne may play a role in weight loss. According to an abstract from the National Institutes of Health (PubMed), studies show that capsaicinoids from chili peppers could play a role in weight management. Studies showed the ingredient to help increase energy, increase lipid oxidation, and decrease appetite which may lead to weight loss. Cayenne contains flavonoids and carotenoids, as well as vitamins A and C. These nutrients may help the body strengthen the immune system and fight free radicals. According to the Linus Pauling Institute at Oregon State University (OSU), flavonoids have strong antioxidant, antiviral, anti-inflammatory, antitumor, anti-allergy, and antiplatelet healing abilities. OSU also states that carotenoids, a compound responsible for giving cayenne its rich red-orange color, are powerful antioxidants that support overall good health. You can buy cayenne in capsule or capsaicin cream form. To treat pain conditions, UMM suggests using a cream containing 0.025 - 0.075% capsaicin no more than four times daily -- the cream should not be used on children under two years old. For digestive problems, UMM recommends a dose of 30 - 120mg three times daily. Some herbalists believe that the capsules do not work as well as a tincture or even taking cayenne powder in some juice or water. It's believed that cayenne begins to work as soon as it is in the mouth, increasing blood flow to all parts of the body. When the mouth is bypassed, as in a capsule, it's thought that the action of the cayenne is delayed and weakened. Cayenne tinctures can be purchased at most health food stores or on the Internet. A tincture is most effective when taken in a ratio of eight drops of cayenne tincture to four ounces of water and drunk three to four times a day. Many people use cayenne in their food on a daily basis as a preventative to disease. It can be cooked in any dish or sprinkled on your food just like salt or pepper. Be careful; it is very hot and most people need to start light and work their way up to stronger doses. Most health food stores and pharmacies carry cayenne in one type or another. It may be more difficult to find the tincture locally. If so, there are many sources online for the various types of cayenne. Mountain Rose Herbs carries organic cayenne powder and capsules. iHerb offers organic cayenne powder to add to culinary dishes. Organic Health and Beauty carries a hot cayenne extract. The University of Michigan Health System (UofMHealth) states that capsaicin cream has few side effects other than a slight burning sensation upon initial use and the potential of allergic reaction. To reduce the risk of allergic reaction, UofMHealth recommends using the cream on a small patch of skin at first. In addition, they caution against using cayenne internally in tincture or capsule form to treat digestive issues without doctor supervision -- it may worsen your condition. If you have an allergy to bananas, latex, kiwi, chestnuts or avocado you may also have an allergic reaction to cayenne pepper. Finally, wear gloves and use extreme caution when handling cayenne powder, undiluted extract, or chili peppers as they may cause burning and irritation to the eyes and skin. Cayenne pepper healing is well documented and accepted by many doctors, researchers, and herbalists. From relieving pain to supporting weight loss to helping the cardiovascular system, cayenne seems to be one of the hardest working herbs on the planet. Use this helpful herb carefully and, to avoid unwanted side effects, always consult your health care provider before using cayenne or any natural remedy.